Sometimes, you learn a lesson the hard way. 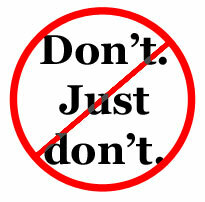 Here are a few tips on things NOT to do before you teach a class! Moisturize: It sounds harmless, but there is nothing grosser than sweating and having salty lotion drip into your eyes and mouth. Save it for after your post-class shower! Have that extra cocktail the night before: Plan ahead! It's way too easy to be convinced to have "just one more" when you're out, so know your limits in advance and stick to your guns. Teaching a cardio format while hungover isn't cute. Second guess yourself: A group ex instructor should be confident in his or her ability to run a great class and give everyone a solid workout. Don't let self-doubt creep into your head right before class starts - it'll distract you and students can smell fear. Put on a new, never-worn outfit: Never ever try to teach a class in new workout clothes. Try everything on in advance and do a few squats and jumps to make sure you'll be comfortable. There are few things that are worse than watching an instructor tug a shirt or shorts down or readjust the girls for an hour! Change your playlist: Unless something major happens, stick with what you've planned. You can always do something different next week, and trying something unrehearsed can have unintended consequences, like running too long or accidentally having too many of the same moves back to back. What else would you say an instructor should NEVER do before class? Eat something "on the run or new food" too close to class time. I eat about 2 hours before class and only lightly. oh boy have I made that mistake more than once. Try new sneakers!! Wear them at home or to another class you are not teaching first!! Painful feet during class is no fun! !